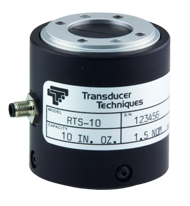 The RTS Series torque sensors were designed to fill the need for accurate torque measurements below 62.5 in.lbs. without giving up stiffness or sensitivity to forces from other directions. 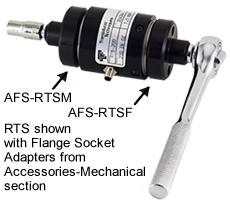 They are manufactured from sensor quality aluminum and anodized for long term durability. Bonded foil strain gages and materials of the highest quality are installed assuring high reliability. The four bolt hole pattern with the use of our O.D. or I.D. pilots on either end allows simple adaptation to any application. P = Thrust S = Distance to center of gravity of test unit. sheer (W), whichever value is attained first.